This 4 hectare island is the largest in a series of outlying islands in the Sans Souci area. 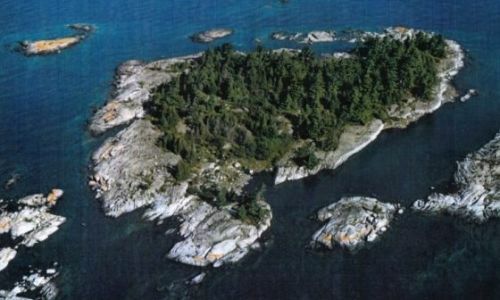 The island is dominated by Precambrian bedrock substrates with wave-washed shores. Shrub swales are found in depressions and along protected shores while higher ground is characterized by White Pine, White Cedar and a mix of shrubs and herbaceous cover. This island, like other outlying islands, is unique in its exposure to extreme wind and wave activity and serves as a critical refuge for migrating birds. the lilies and sought the Trilliums in the Springtime. dance, the call of the Whippoorwill when one was entering slumber. in the water and rowing their boat made by Grandpa. could share these moments once again.